The Illumion are almost a tipical symphonic progressive rock band from Netherlands, where style, Symphonic Progressive Rock, predominates in many bands originating from that country, where we can mention some of them, such as "Earth and Fire", "Egdon Heath", "Finch", "Flamborough Head", "Focus", "Golden Earring", "Kayak", "Like Wendy", "Mangrove", "Odyssice", "PBII", "Plackband", "Salmon" and "Trion", where most is already enshrined in international progressive rock scene. 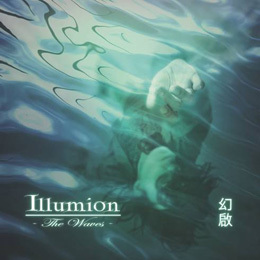 Illumion is an amazing new symphonic progressive rock band, who, with incredible skill and talent of its members, introduces into their compositions, subtle touches of a Melodic Prog Metal, puting together passages of Art-Rock. But, their music is so clean and lovely, totally dominated by incredible guitar solos, beautifully led by lovely Eveline van Kampen, that sometimes it float around through the heavy rhythms, but, not so aggressive, characteristic of the melodic metal style, however, most often, the guitar's solos, prevails the symphonic style. Another important point on this quintet, and a good moment to focus on the musical performance from the group, are the vocals from Esther Ladiges, all her vocals tones are clearly the trademark of the band, her voices tones is soft and fits perfect with the music, singing in english, Esther Ladiges is an excellent vocalist, she has a well recognisable singing style, blending vocal tones in the same line from female singers such as "Floor Jansen", "Rachel Jones", "Anne-Marie Helder", "Christina Booth", "Sharon den Adel" and "Anneke van Giersbergen", meanwhile, she clearly does not try to copy any of them, in that case, without comparison, reveling a single poetic feeling and harmonic to the compositions. Continuing with more details about the wonderful band's music, they use a diverse instrumental composition, in tempo and structure, using different rhythms, with the help of acoustic instruments like Mandolin, Acoustic Guitars, Guzheng (The early types of guzheng emerged during the Warring States period. It was largely influenced by the se, a plucked stringed instrument. It became prominent during the Qin period, and by the Tang Dynasty, the guzheng was arguably the most commonly played instrument in China.) and Erhu (The erhu can be traced back to instruments introduced into China more than a thousand years ago.) also it´s possible listen nice electronic effects, taken from guitar-synths and atmospheric keyboard arrangements, lastly, drums and bass together like a supporting the instrumental, giving an extraordinary power to the arrangements. "The Waves" is their second album, where I consider like a masterpiece, generously edited in two different formats, CD and Vinyl, where, especially I chose to have the vinyl, a double album, that including a beautiful art-work, featuring eleven tracks including two bonus track, not evaluable on the CD. It is hard to determine which is the best track on "The Waves" album, not one specifically is better than the others. The tracks are all of an evenly high quality. If I had to choose my favourite tracks would be "Ember", "Adamantine", "A Tale Of Kings", "Espirando", "Mystify" and "The Waves", this last song, revels the exact identity of this band, splendid guitar solos, and mainly, by the vocal performance. You must enjoy this album and this incredible band. The Illumion follows in the same musical line and blendig styles from many bands such as "Earth And Fire", "Egdon Heath", "The Gathering", "Magenta", "Karnataka", "Ambeon", "Finch", "Flamborough Head", "The Aurora Project", "Focus", "Golden Earring", "After Forever", "Kayak", "Like Wendy", "Agua De Annique", "Mangrove", "Odyssice", "PBII", "Plackband", "Salmon", "Trion" and so on.